Is designed for anyone working with or in proximity to H2S. Covers H2S properties, hazard controls, PPE, rescue protocols and more. Average duration: 2 – 2.5 Hours. Anyone working with or who could potentially be exposed to H2S must receive H2S safety training according to Federal and Provincial regulations. This H2S awareness course will familiarize you with basic H2S properties, personal protection equipment, hazard controls, operating procedures, and rescue protocols which will keep you safe on the job. Rangan M. Verified Buyer Customer service was excellent, even on a weekend when I need[ed to] talk to someone. Very prompt service. Ting-jung K. Verified Buyer Convenient and easy for everyone to do the course anytime and any where. Trent G. Verified Buyer Nice site, everything worked. I enjoyed the course at my own pace. Kathleen G. Verified Buyer Shannon was very helpful! She was quick and was very informative. I thank her for her help and prompt response. Gwen P Verified Buyer The courses are thorough and easy to follow and understand. Thank you for supplying a easy system very good experience. Stephen K. Verified Buyer As someone who has worked Offshore for over 30 years, I can't thank you enough, Well done on a very informative H2S course. A printable certificate is issued immediately upon successful course completion. Wallet-sized plastic certificates are also available. Training can be completed in two to two and a half hours. Work at your own pace with no time limit. A sturdy plastic H2S Training wallet card may also be ordered directly from your Go Safety account for an additional fee. These hard-copy certificates are printed on durable 0.30mm polycarbonate plastic. WHO NEEDS TO TAKE H2S AWARENESS TRAINING? Hydrogen sulfide (H2S) occurs naturally as either a colourless and poisonous gas or dissolved in water, crude oil, or natural gas condensate. It is also is a common waste product of a variety of industrial processes including petroleum refinement, water treatment, and iron smelting. As such, it is imperative that anyone who works with or may be exposed to H2S be trained in its properties, hazard controls, related monitoring equipment, and PPE, as well as rescue and first aid procedures. WHAT TOPICS ARE COVERED IN THIS H2S TRAINING COURSE? Basic H2S properties, where it can be found, and how it can be produced. Employer and employee responsibilities surrounding H2S. Circumstances and risks of H2S exposure. H2S monitors and detection instruments. Short and long-term effects of H2S exposure. Safety protocols, personal protection equipment, and rescue procedures. Employers must show due-diligence in training employees on all relevant hazards and equipment in their work place. In the case of H2S hazards, this may include equipment training, first aid, and rescue procedures. HOW LONG WILL IT TAKE FOR ME TO COMPLETE THE H2S TRAINING COURSE? WILL THE H2S TRAINING PROGRAM WORK ON MY TABLET OR SMARTPHONE? HOW CAN I ACCESS MY H2S RECORD OF TRAINING? 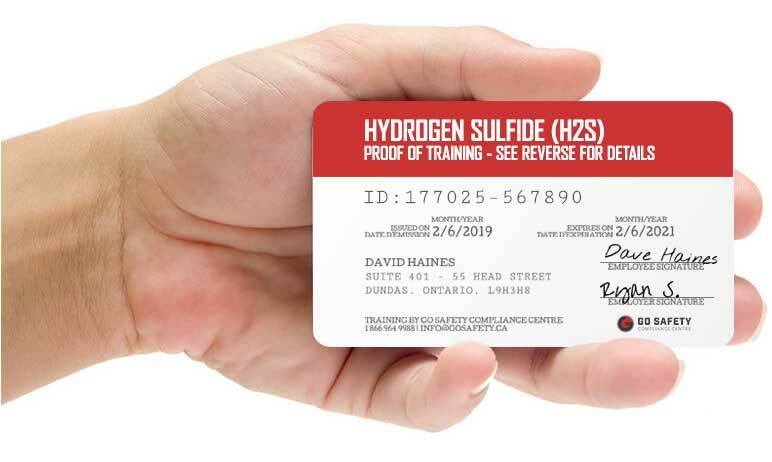 You can now purchase a wallet card version of your H2S certificate online. Log into your account, go to Certifications, click then the green order button to the left of the certificate list. Select the course you would like to purchase the wallet card for and follow the prompts. WHAT HAPPENS IF I LOSE MY H2S TRAINING CERTIFICATE? 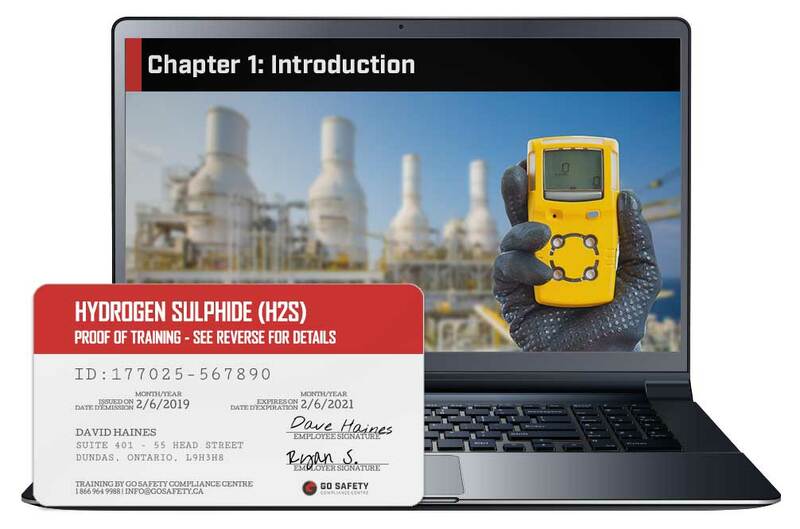 CAN I PURCHASE H2S TRAINING FOR SOMEONE ELSE?